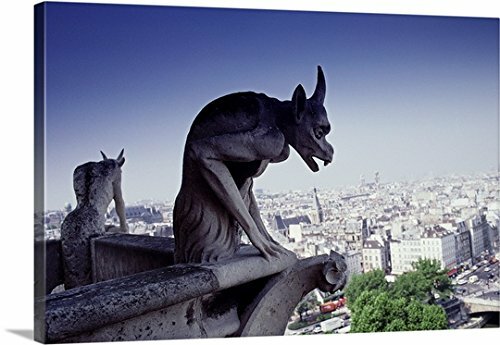 Gallery-Wrapped Canvas entitled 'Gargoyle, View from Notre Dame, Paris'. GARGOYLES ON PARAPET, NOTRE-DAME, PARIS. Multiple sizes available. Primary colors within this image include: Black, Silver, Muted Blue, Dark Forest Green. Made in the USA. Satisfaction guaranteed. Archival-quality UV-resistant inks. Canvas frames are built with farmed or reclaimed domestic (pine or poplar) wood. Canvas is designed to prevent fading.